If character training is a primary goal of parenting, and I believe it is, then the best way to instill it is through the demeanor and behavior of a father. Identification with him is a far more efficient teacher than lecturing, scolding, punishing, bribing, and cajoling. Boys watch their dads intently, noting every minor detail of behavior and values. Your sons will imitate much of what you do. If you blow up regularly and insult your wife, your boys will treat their mother and other females disrespectfully. If you drink to excess, your kids will be at risk for chemical substance abuse. If you curse or smoke or fight with your coworkers, your boys will probably follow suit. If you are selfish or mean or angry, you’ll see those characteristics displayed in the next generation. Fortunately, the converse is also true. If you are honest, trustworthy, caring, loving, self-disciplined, and God-fearing, your boys will be influenced by those traits as they age. If you are deeply committed to Jesus Christ and live by biblical principles, your children will probably follow in your footsteps. So much depends on what they observe in you, for better or worse. What is encouragement and why is it so essential for maintaining healthy marriages and families. Encouragement represents positive influence, to literally give courage to someone—not waiting until it’s deserved or asked for, but taking initiative when things are difficult and uncertain. There are many synonyms one could use: to give support, confidence or hope to another; to hearten, cheer, uplift, inspire, motivate, vitalize, embolden, or rally. The impact can be far reaching and often makes a difference when relationships begin to falter. Even the neuroscience gives credence to this dynamic. Criticism and negativity release harmful stress hormones, inhibit concentration, diminish the brain’s executive functioning, and tend to create knee-jerk reactions vs. calm and rational thinking. 1. The first thing about an encourager is that he or she is practical. Many women feel that the job of “mom” is boring and monotonous–and they are right! But so is practically every other occupation. I once stayed in a hotel next to the room of a famous cellist. I could hear him through the walls (believe me!) as he practiced hour after hour. He did not play beautiful symphonic renditions; he repeated scales over and over. As the cellist strolled onstage that evening, I’m sure many in the audience thought, “What a glamorous life!” Some glamour. He spent the entire day alone in his hotel room. Few of us enjoy heart-thumping excitement each moment of our professional lives. How thrilling is the work of a medical pathologist who examines bacterial cultures from morning until night or a dentist who spends his days drilling and filling? The job of a homemaker can be about as boring as most others. Yet in terms of significance, no job can compete with a mother’s task of shaping and molding a human being in the morning of life. Not every woman chooses to be a mother, of course, but those who do are worthy of our admiration and respect. “Children,” we are told in Scripture, “are a blessing” (Psalm 37:26, TLB). If so, then mothers are His loving gift to them. The Gospel Parade goes to St. Bernard Parish! I received a blog post on my professionalmom.com site last year, Debbie Smith of Wee Can Know ministry, a friend for many years, had read my “The Gospel Parade” book and had actually made shoebox floats of the parade in the book! I was thrilled, not only because she loved my book, but as a children’s ministry to the Greater New Orleans area, she and her husband, Phil, had multiple opportunities to share the Gospel story through these floats during the year. Phil bought wagons and they placed the floats in order, pulling them along throughout the Mardi Gras season. Fast-forward to March 2018, Debbie called me and invited Joe McDonald Ministry to walk (and pull) in the St. Bernard Parish Irish Italian Islenos Parade in Chalmette, Louisiana. Joe and I walked the 6 mile parade with Debbie and her team, pulling The Gospel Parade on 6 wagons. It was so fun as we joined the huge parade with giant floats and marching teams. We gave out 800 Gospel packets with bracelets, 200 The Gospel Parade book packets with bracelets, 900 John 3:16 doubloons, 850 additional tracts, and 400 Wordless Book tracts for a today of 3,150 witnesses! Our continued prayer is that many people at that parade will be saved from reading this literature and from seeing the floats! My personal blessing is that Phil and Debbie ran with the inspiration from The Gospel Parade, more children are saved, and God is glorified! Joe and I left a box of 300+ mini books and Debbie has already distributed some at a Bible Club meeting! I want to add a thank you to YOU! Because of you, we have been able to print mini books in Spanish and English and have distributed them around the World! Got plenty of time? Here is my whole product line; inexpensive, useful products to help any mom or caregiver! Let me know what you chose and why! See additional posts for product collections if you are in a hurry! Don’t miss these Household Helps in my first collection of products: Click the link below to enter my store! Easter is a great time to share the Good News! Nothing in this world is more important than preparing your family for life together in eternity. That’s why we want you to have our FREE eBook, Sharing Jesus With Your Children. It could very well be the best thing you’ll read today. Support Joe McDonald Ministry when you shop at Amazon.com! I know better…no one wants to start working out during the holidays! 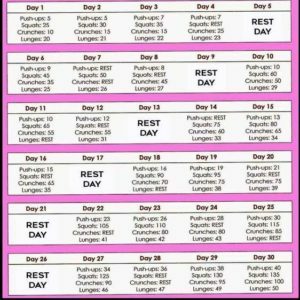 But I couldn’t help sharing this Workout Challenge I found on the Internet! I started it 2 days ago and it is so easy and fast, any mom (or dad) has time for it. I plan to do it and see if I have any results. It takes about 5 minutes a day. Let me know if you try it and how you do! I am the world’s worst about regular exercise routines but I may be able to stick to this one. Let’s do it together, or if you want to wait until the New Year, save it to your computer or phone and try it then! Now more than ever, families need prayer. I am sending a challenge to all families to pray together at some time each day. Rally the troops, put down your phones and devices and pray. Make a plan to have family time (even 10 minutes) and prepare your family for the days ahead. This will be a task at first, but within about 20 days, it will become a habit and bless you beyond anything you have experienced. Take a few items on the list and work your way to the end, you will be blessed and your family will be building a great foundation in the Lord.